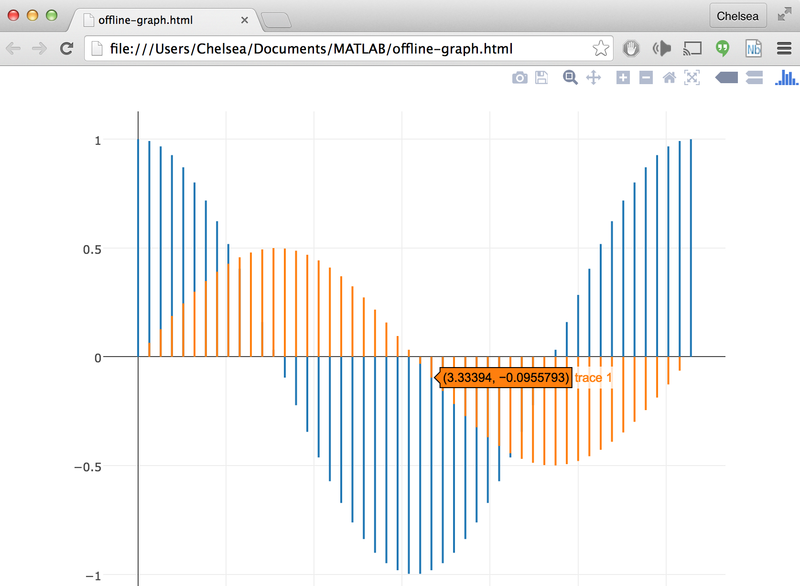 This API allows MATLAB users to generate Plotly graphs from the desktop MATLAB environment: turning MATLAB figures into interactive, shareable, collaborative projects. For more information on how to create specific chart types see our documentation examples. The Plotly MATLAB Open Source Graphing Library has been embedded into our MATLAB toolboxes and our Plotly credentials have been saved using plotlysetup.m. In order to start using the Plotly MATLAB API all we have to do now is start MATLAB! More information regarding installation / setting up the Plotly MATLAB API can be found on the online documentation. Plotly charts are described declaratively with struct and cell array objects. For an extensive list of the keys used to describe plotly graphs see our reference page. To get an idea of how the MATLAB API works, check out this simple example of how to translate a MATLAB figure, modify some attributes, and then send it to Plotly. >> fig.PlotOptions.Strip = 0; % If 0, don't strip MATLAB's styling in translation. If 1, strip MATLAB's styling. 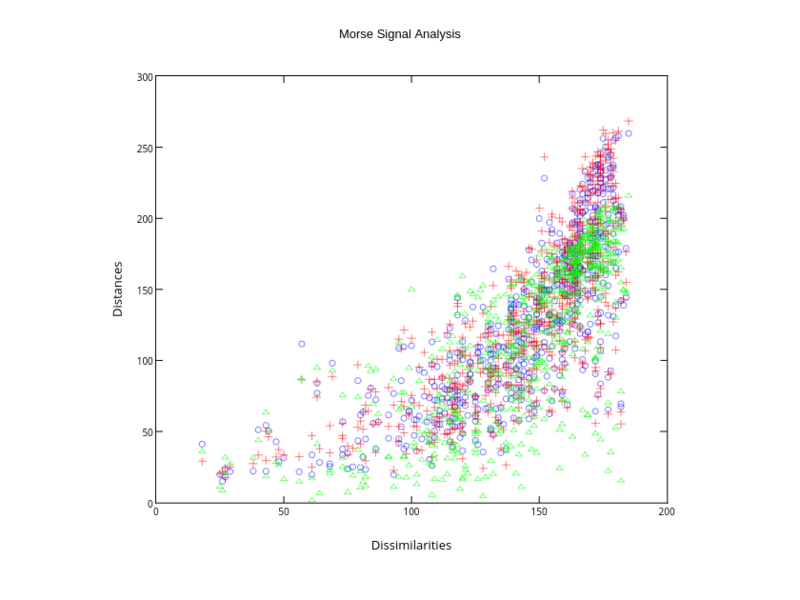 fig2plotly.m: Plot a MATLAB figure object with Plotly fig2plotly.m converts MATLAB figures to online Plotly graphs. MATLAB describes figures differently than Plotly. Plotly's MATLAB library crawls the MATLAB figure objects and translates the MATLAB attributes into the structure that Plotly uses to describe and draw data visualizations. gcf - root figure object handle [double]. The above plot is the ouptut from calling the scatter.m and line.m functions inherent in MATLAB. Using the fig2plotly.m function, we are able to extract the relevant data from the MATLAB figure object and throw the output over to our Plotly account! The returned response variable, resp, is a structure array which contains a url field with the address of our plot. We can make a Plotly graph in Matlab offline which will be saved as an html file to your current working directory using Plotly Offline. These html files will contain all of the necessary dependencies to render the plot within a browser. getplotlyfig.m: Get data, style, and layout from the plots stored online One of Plotly's secret powers is the ability to translate between MATLAB's structure/cell array syntax and JSON. This allows a smooth transition between your figures in MATLAB and those stored in your Plotly account. getplotlyfig.m allows you to grab the data, style, and layout information from your plots saved online. In fact, getploylyfig.m lets you grab the data, Style and layout of anyone's Plotly plots (as long as they are made public) - not just your own! See a graph you like online? Grab the style, layout, and data and make one for yourself. file_owner - user name associated with the plot [string]. Here we can use getplotlyfig.m and have a go at changing the bar and line colours on a different graph: https://plot.ly/~matlab_user_guide/664/ ! saveplotlyfig.m: save your MATLAB figure as an image using Plotly. saveplotlyfig.m allows you to convert your MATLAB figures into static images (.png, .svg, .pdf, .jpeg) using Plotly. NOTE: if format is unspecified, saveplotlyfig will use the image format given by the extension of filename. If filename does not have an explicit extension (ex: filename.pdf), the default format of PNG will be used for the conversion. Image 'filename' of the specified format (PNG, PDF, JPEG, or SVG) saved to your working directory. Let's have a look at saveplotlyfig.m to see how it works. Check out this next plot that was featured on the MATLAB plot gallery. Boom! morse.png has been automatically saved to our working directory. Let's have a look.